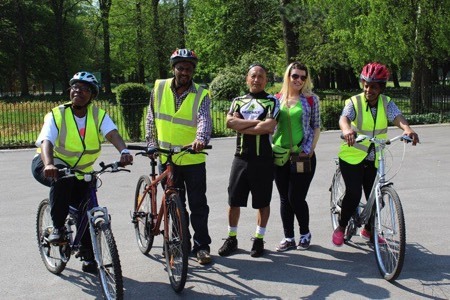 You can ride for hundreds of miles in Greater Manchester on traffic-free cycle paths, or on very quiet roads. And lots of main roads have dedicated cycle paths to make your journey easier. Use our online or paper maps to get you on your way. Greater Manchester's six special Cycleways give you more space to ride in town and country: you'll be separated from traffic or on completely traffic-free paths most of the time. 4 mile, mostly traffic-free, route from Timperley to the airport. 6 mile traffic-free route from Manchester city centre to Ashton. 11 mile traffic-free route from Manchester city centre to Altincham or the Trafford centre. 1 mile route separated from traffic, from Manchester city centre to Broughton. 3 mile, mostly traffic-free route from Stockport town centre to Parrs Wood and Cheadle. 3 mile route, mostly separated from traffic, from Didsbury village to Whitworth park. Pick the area you want from the main map. Then click 'Key: click to view' down the side of the local map to see how different routes are shown. There's a special cycling map for each of the ten areas of Greater Manchester. Pick them up at a TfGM travelshop, local library or at some council offices and bike shops. Tell us your postal address and how many of each map you want. Find a route that suits you with our online route finder. For more information about journey planning, see plan a journey.